Call for STSMs continuously OPENED: Applications can be submitted any time & will be reviewed at the end of each month. We are happy to announce that we have opened an activity that is centered on "mobility grants", also called Short-Term Scientific Missions (STSMs). 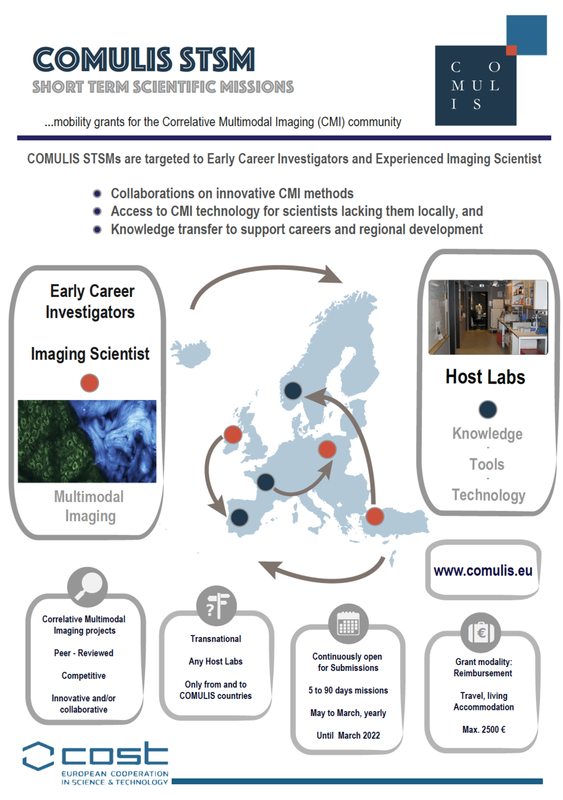 In a Nutshell, Early Career Investigatos (ECI) and and Experience Image Scientists, from Research Labs AND Core facilities, can apply for funds to cover their expenses when visiting a Host Lab in a different country (Lab or industry) where they will perform a short scientific project strictly focused on Correlative Multimodal projects, and that should enable: 1) collaborations on innovative CMI methods, 2) access to CMI technology and/or image analysis tools for scientists lacking them locally, 3) knowledge transfers to support careers and regional development. Please, follow the application procedure as described here, and contact the COMULIS STSM Coordinator Julia Fernandez Rodriguez (juliafer@cci.sahlgrenska.gu.se) or the COMULIS Action Chair Andreas Walter (andreas.walter@vbcf.ac.at) for further questions. The applicant needs to encode an STSM application by logging into e-COST: https://e-services.cost.eu/ and clicking on the STSM application tab. The applicants must use the on-line registration tool to register their request for an STSM at least 3 weeks before the beginning of the STSM.